Artist, Helen (Honey) Clarke featured in Global Citizens Creative Arts Text. 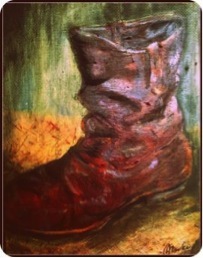 Honey Clarke has her painting called Boot featured in Global Citizens Creative Arts Text. She is an artist who loves capturing the people and places that she encounters everyday. It is not surprising then that she has taught english and drama for many years. She loves writing and illustrating children’s stories. “There’s always a story behind every painting I do,” she says. Helen enjoys capturing the essence of humanity in particular: sometimes conveying it in the portraits she does or in the whacky cartooning of everyday life. I bought the painting featured below and incorporated the essence into a themed Visual Arts lesson for the book. It has been through the honest simple way she has reflected her ideas about work that I was able to link the idea to a Flash Fiction story written by Vi Brown. It is called A Gift for Tibu Vi calls this type of writing a Literary Quick Fix. Helen started out painting wild life and her works were featured in a wildlife magazine in 2002. Helen made a name for herself among animal lovers by drawing unique animal portraits that capture the subject’s personality as well as their appearance. Helen did not find it easy to broaden her horizons and move into the field of portraiture. Helen won a Regional Arts Bursary to McGreggor Winter School to study painting in acrylics with Lucja Ray. 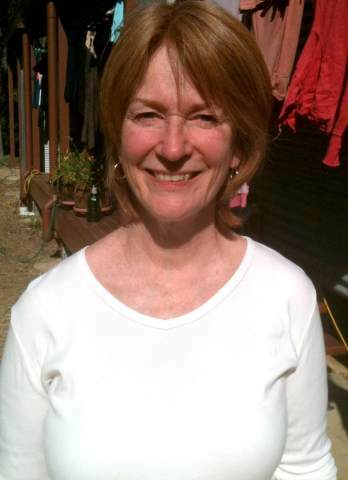 After studying animation she went on to illustrate a privately published work, including a Kodaly approach music book for preschoolers, a children’s book entitled, “Chunder Chook and his 22 Wives”, by Pete Lane and a yarn called “No Dog” by Steve Gatehouse. Artist, Helen (Honey) Clarke loves capturing the people and places that she encounters everyday. It is teachers like Helen that we are trying to attract to our community of learning inquiry and studio practice. Helen was eager to have her work used by way of illustrating the story A Gift for Tibu. We hope to see her more at Teachers Pay Teachers both illustrating the work of others and perhaps even illustrating books of her own. Art & Soul Gallery. Boonah. Murphy,J. (2013) Global Citizens Creative Arts Text. Insights and Activities. Kindle Ed. This entry was posted in artists, authors, illustrators and tagged a guft for tibu, art & soul gallery, boot painting, cartooning, creative arts leadership, flash ficition, helen clarke, honey, illustration, oil on canvas, teachers pay teachers, vi brown on June 4, 2013 by Jo Murphy.